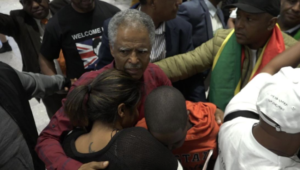 Andargachew Tsege has been reunited with his family in London in an emotional welcome at the Heathrow Airport where Ethiopians came out in huge numbers to celebrate his release after four years of imprisonment. Upon arrival, Andy acknowledged Prime Minister Abiy Ahmed for playing a key role to get him released. He said there was indeed a battle within the ruling party concerning his release. The scene at the Airport was pomp and celebration with Ethiopians singing a freedom song written by Andy himself, but popularized in the last few days following his release. Andy thanked everyone who fought for release especially the British government. “I know British diplomacy is a very silent diplomacy. I know they were doing really their best. I use this opportunity to express my gratefulness to the Ambassador, the councilor and the people of Britain who sent me books,” he told a gaggle of reporters at the airport. Meanwhile the Evening Standard reported that Prime Minister Theresa May has thanked her Ethiopian counterpart for the release Andargachew Tsege, as well as other prisoners, during telephone talks covering a range of issues. The report said a spokesman for Mrs May said she had congratulated her Ethiopian counterpart on his appointment and said the UK “firmly supported his reform and reconciliation efforts”. “The Prime Minister thanked Prime Minister Ahmed for the release of prisoners including British national Andargachew Tsege,” the spokesman added. Foreign Secretary Boris Johnson has also applaud the release of Andargachew Tsege, who was on death row in Ethiopia. The leader of an opposition movement, Andargachew Tsege, was kidnapped at a Yemeni airport in June 2014 in a joint operation by the Yemeni and Ethiopian intelligence. He was sentenced to death in absentia on trumped up terrorism charges in 2009. The father of three had spent much of his time in UK as a political refugee. He returned home twice but faced imprisonment and harassment by the regime. His arrest drew international condemnation and the UK was criticized for not doing enough to secure the release of one of its citizens.